Last week I delivered some whole salamis to a retail customer. The gentleman who received the products and checked the invoice was reluctant to accept the stock due to the fact that the salamis had some white mould growing on the outside. He was convinced that the salamis were “off” and mouldy and should be rejected. It took his manager several minutes to convince him that it was actually a desirable thing to have on a salami and he should accept the order. In the same week I read an article about a TED talk given by Dr Johnathan Eisen regarding the benefits of microbes in our lives. Microbes protect us from pathogens, they boost our immune systems, they can keep us slim, reduce stress and aid digestion. So what is that white stuff on the outside of the salami? The scientific name is penicillium nalgiovense and it is a fungus. It has a very important role in the curing process of a salami made in a natural casing as it prevents other harmful bacteria from growing on the product and imparts a characteristic nutty flavour. Far more accepted and understood are the cousins penicillium camemberti and roqueforti which are similar strains of the penicillium family and are used in cheese making. My friend in goods receiving had no problem accepting a delivery of Brie from Fairview covered in white mould and was happy to inform me that gorgonzola was a good seller in the store. For the sake of clarity, penicillin the antibiotic is made from penicillium chrysogenum and is something I am allergic to however I suffer no side effects from eating salami or cheese (thankfully). 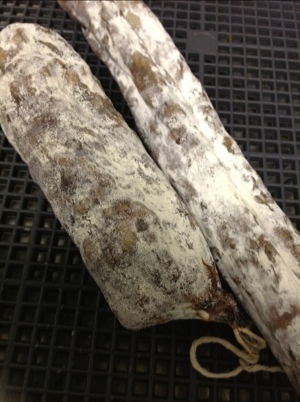 White mould will only grow on a salami that has matured slowly using a natural fermentation process. Commercial salamis that are made with GDLs will not have time to develop any moulds and are usually produced in plastic casings that inhibit mould growth. Next time you see a “mouldy” white salami make sure you appreciate the time taken to produce it and admire one of natures gifts to us. Most interesting indeed – thanks Bacon Boss!